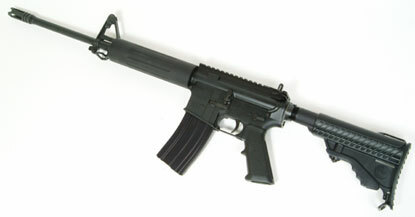 Made by DPMS exclusively for ZX Gun, the ZX M4 is a lightweight, optics ready AR. Perfect for three gun competions, tactical applications or simply plinking, the ZX M4 is customized with an aluminum free float tube, tactical charging latch, DPMS flash hider and collapsable stock, and four 30rd magazines. Web sling, cleaning kit and hard rifle case are included. We BUY SELL TRADE quality firearms! *Sat. hours subject to gun show schedule.